Kronos Colony. Primary outpost of the System on the Saturnian moon Titan and one of the most populous and important colonies in the outer Solar System. Situated on the shores of the Ligeia Mare close to the mouth of the hydrocarbon river known as the Vid Flumina, Kronos began as a harvesting operation for Titan’s exotic hydrocarbons and nitrogen, but has grown into an important and diverse colony. Titan’s liquid hydrocarbon rivers, lakes and seas make the usual mechs and rovers less fully useful for getting around, particularly in the polar regions where the majority of the lakes and flumina are. More than anywhere else in the System, Titan’s Kronos colony employs ground-effect speeders for the majority of its local transport. 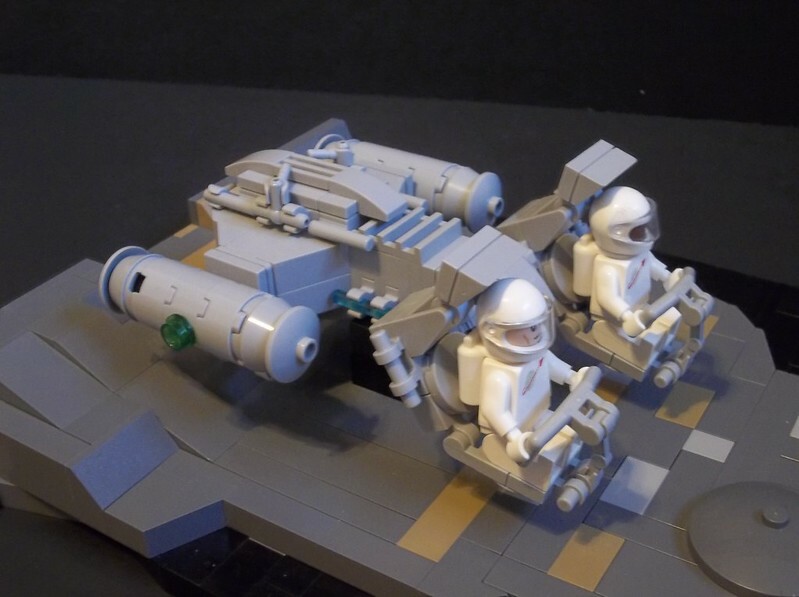 Recently, rumours of a secret Blacktron separatist base in the Xanadu region of Titan have prompted an increase in patrols, and Keyshawn Friedman and Jan Meyerdahl pilot their R22 Avalon speeder across a spit of land jutting out into the Ligeia Mare. Titan was a big moon, however, larger than the planet Mercury. Surely the Blacktron couldn’t be anywhere close to such a large and important System outpost…? 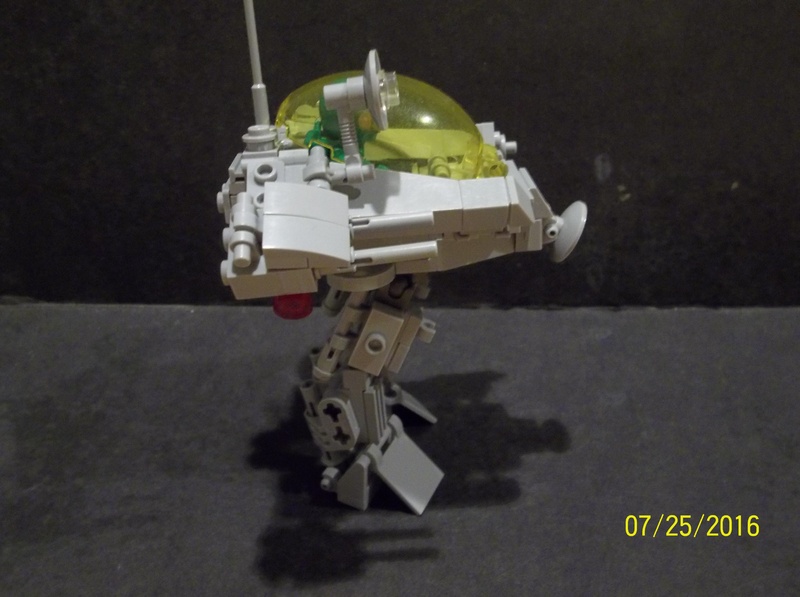 Okay, technically I built the speeder and then decided to locate it on Titan, but Titan’s an interesting place to put a Neoclassic Space outpost, and I decided it needed to be done. All the locations on Titan are real astronomic features of the moon, for added realism. I’m not sure that black is necessarily the right colour for Titan’s liquid methane seas, but it works for modelling purposes. 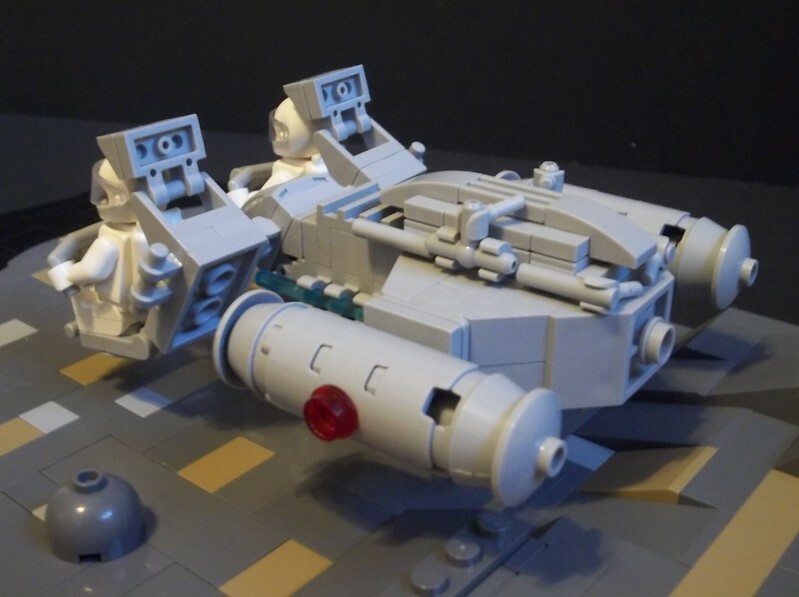 This entry was posted in Lego Classic Space, Lego Space, Speeders and tagged Classic Space, Lego, MOC, Neoclassic Space, Space, Speeder, Titan on May 28, 2018 by geoffhorswood. 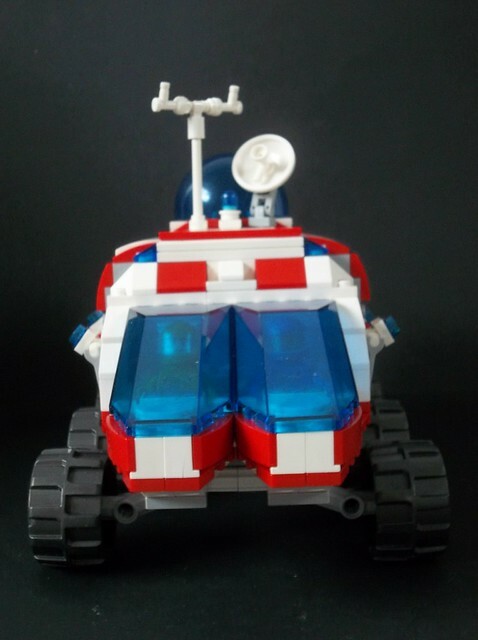 The Mobile Rescue Coordination Centre (MRCC) is a large surface rover used by the Q-Tron space rescue organisation as a local networking hub and temporary headquarters for rescue and disaster-relief efforts. Crewed by at least four and usually up to six Q-Tron personnel, the rover incorporates power-generation capacity enough to serve as an emergency power source for quite a large base; its well-shielded antimatter annihilation reactor is both dramatically smaller than any fusion generator of equivalent power and completely self-contained in the rear-mounted cylinder. Inside the rover’s relatively capacious rear section are computers and communications gear for coordination of rescue efforts and preliminary structural analysis, as well as strategic planning of immediate and longer-term relief. There are also three small fusion units employed for production of specific raw materials via the nuclear-alchemic process of directed multi-step nuclear fusion. In this way materials like boron, oxygen, light metals such as aluminium and even heavier metals like iron can be produced in varying amounts. 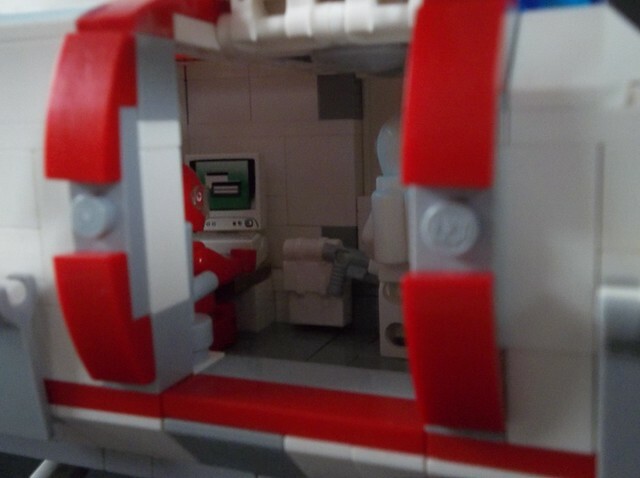 A Q-Tron astronaut at the side access hatch. Fusion reactors are mounted between the forward cockpits and the rear compartment. 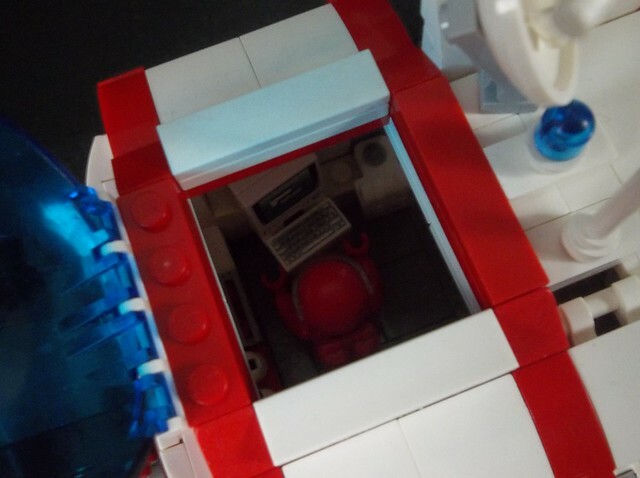 Overhead view through roof dome. Since the MRCC serves as a local headquarters, it can also deploy a number of inflatable temporary shelters to serve as accommodation for Q-Tron personnel. These double-walled chambers can be easily inflated and then buried in planetary regolith for insulation and micrometeorite protection. The headquarters/coordination role of the MRCC rover means that it is less well-equipped for direct hands-on rescue attempts than other more specialised equipment such as the Recovery Hovercrane or the Medevac Hovercraft antigrav. This is not its role, however, and the Q-Tron organisation consider the tradeoff worthwhile. 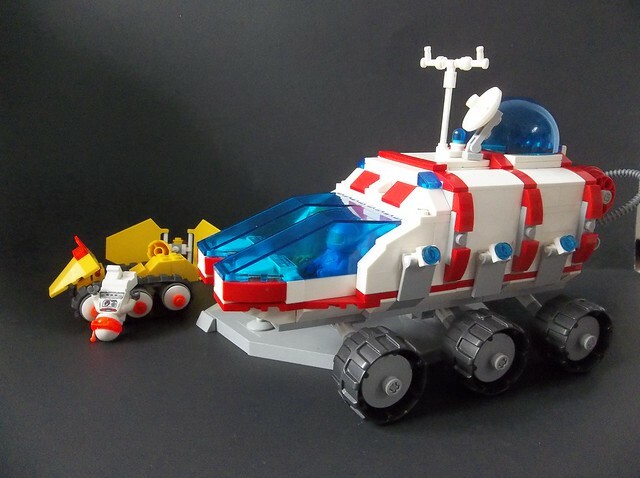 I’ve had it in mind to build a larger Q-Tron rover ever since I invented the theme back in November, and what better excuse to follow through on the impulse than it’s FebRovery? 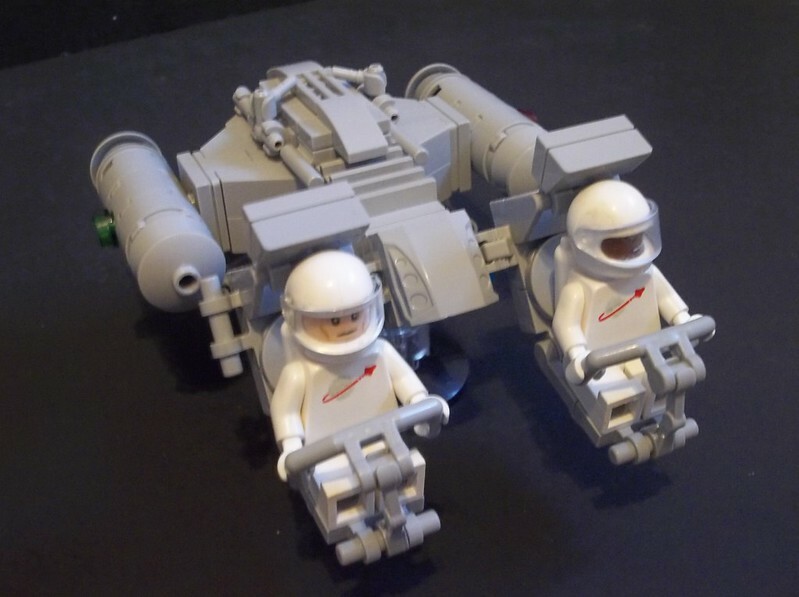 This has actually turned out as a fairly conventional build; I guess my 928 Space Cruiser and Moonbase-trained building instincts still run true if I don’t deliberately step out of default. 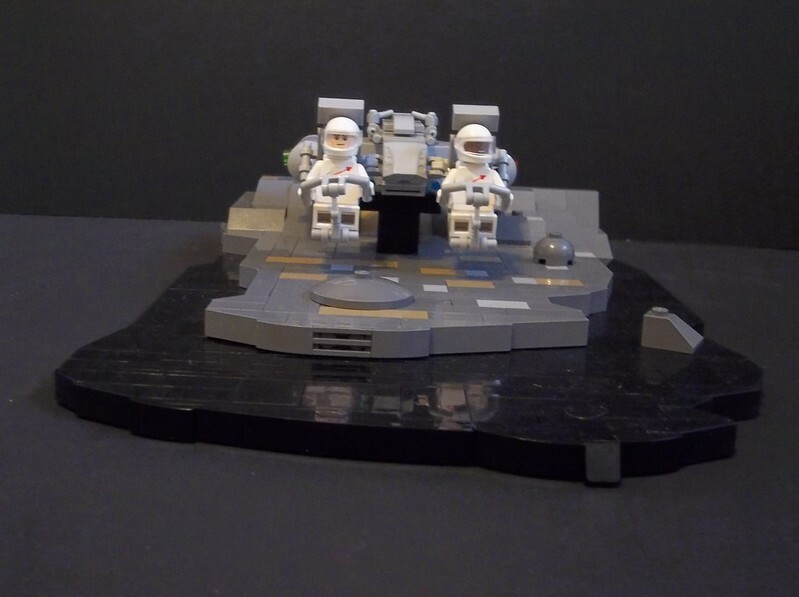 The roof doesn’t detach, unfortunately, but the two side doors and the dome open up (and the cockpit canopies, of course). Not that anyone with hands bigger than a 4-year-old’s is going to be able to access the interior compartment by those tiny holes, but there you are. I was thinking I still lacked sufficient tiles to smooth off the studdy floor of the interior, but then I remembered I’d acquired some more and used them on a little tablescrap build that could be taken apart for the pieces. So the interior is now tiled and looks much better. Attention to detail. Not instinctive for me yet. 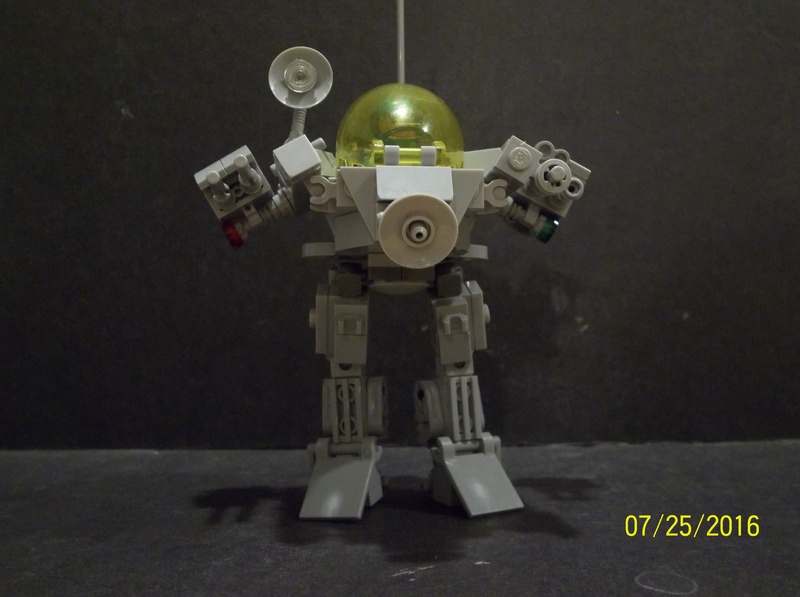 This entry was posted in Lego Classic Space, Lego Space, Space Rovers and tagged Febrovery, Interior, Lego, MOC, Q-Tron, Space, Space Rescue, Space Rover on February 20, 2018 by geoffhorswood. 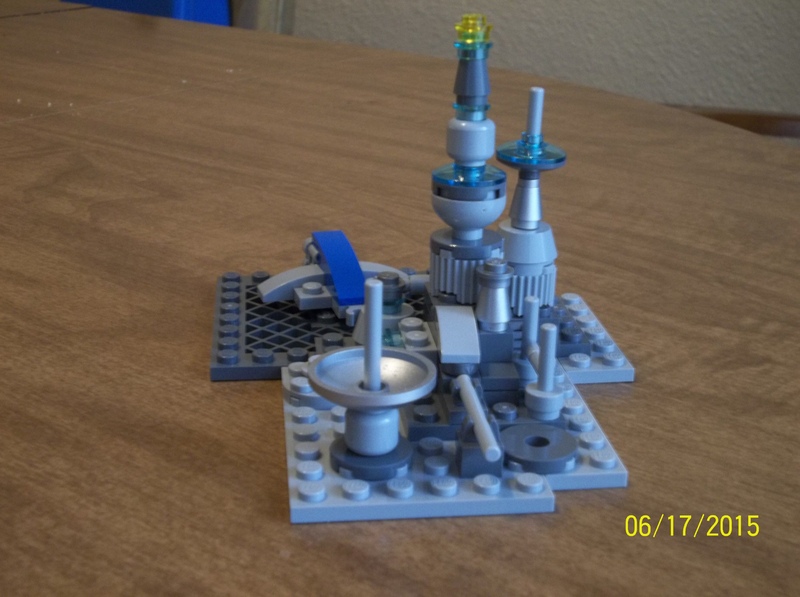 This could just about be my LEGO building motto, but it’s nonetheless true. 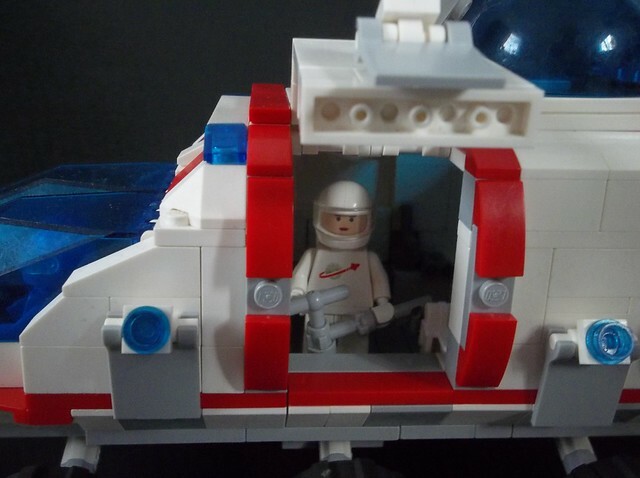 Astronauts are cooler than regular pilots. Star Wars is cooler than Earth wars. Space aliens are cooler than illegal aliens. You get the point. 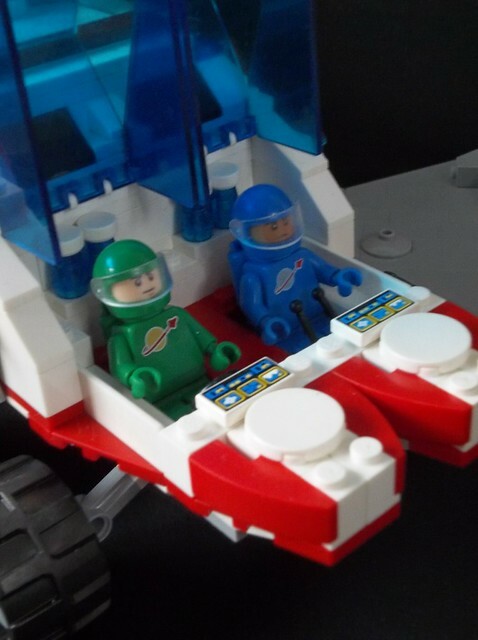 Anyway, the various classic LEGO Space themes gave us a world where humans are in space, big time. 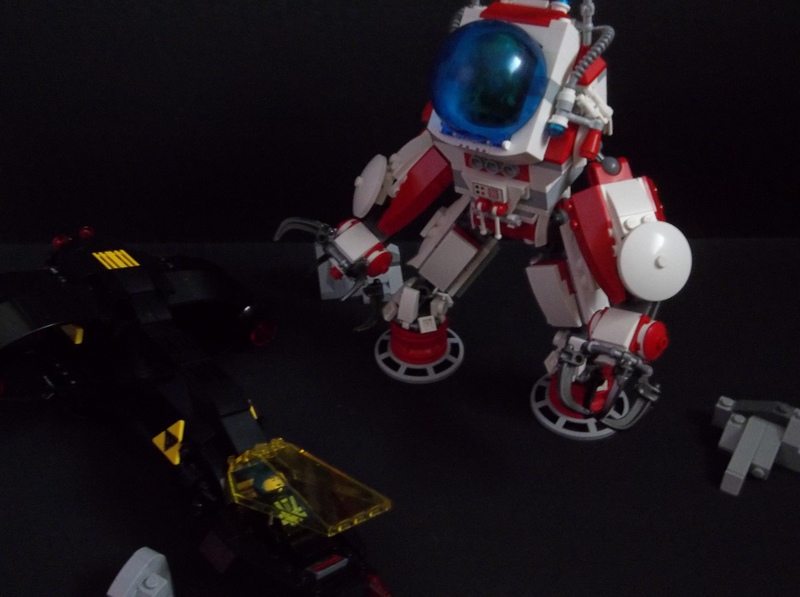 The original Classic prototheme was a sort of semirealistic basic exploration theme; Blacktron gave us a criminal or rebel element; Space Police introduced us to law enforcement in space. 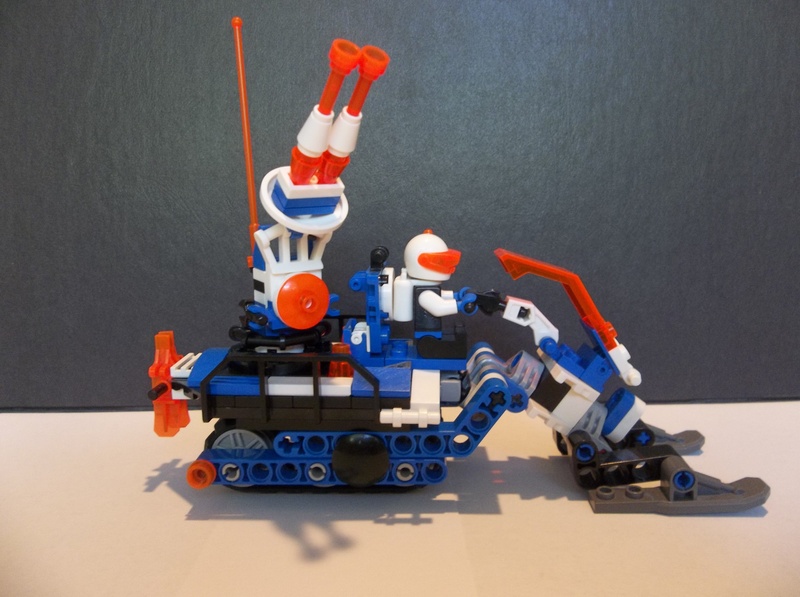 M-Tron showed us the world of space haulage, or possibly mining or manufacturing of some form, and Ice Planet gave us arctic research in space. 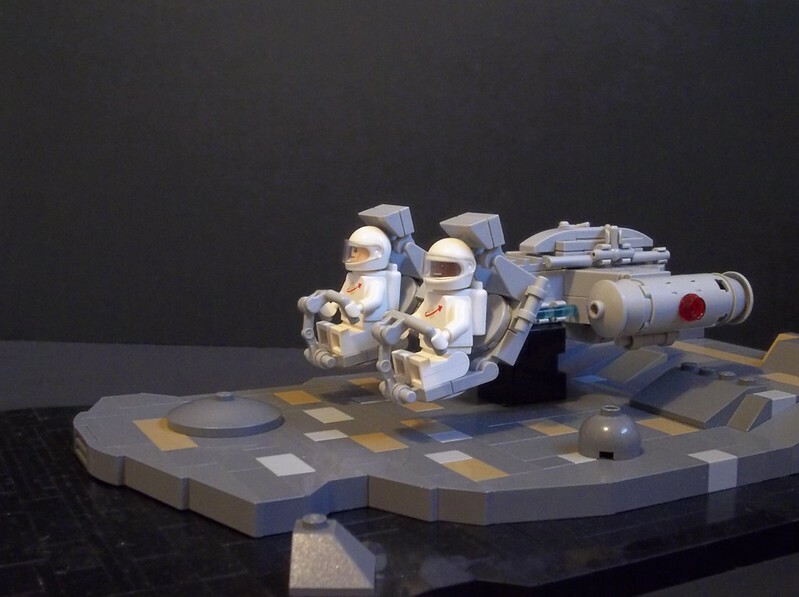 The year-to-year subthematic overlap placed all these incarnations of LEGO Space in the same universe, so it’s quite evident: in the LEGO future, humans are living and working in space. LEGO City is the modern “real life” theme, giving us brick-built versions of everything from waste trucks to pizza parlors. 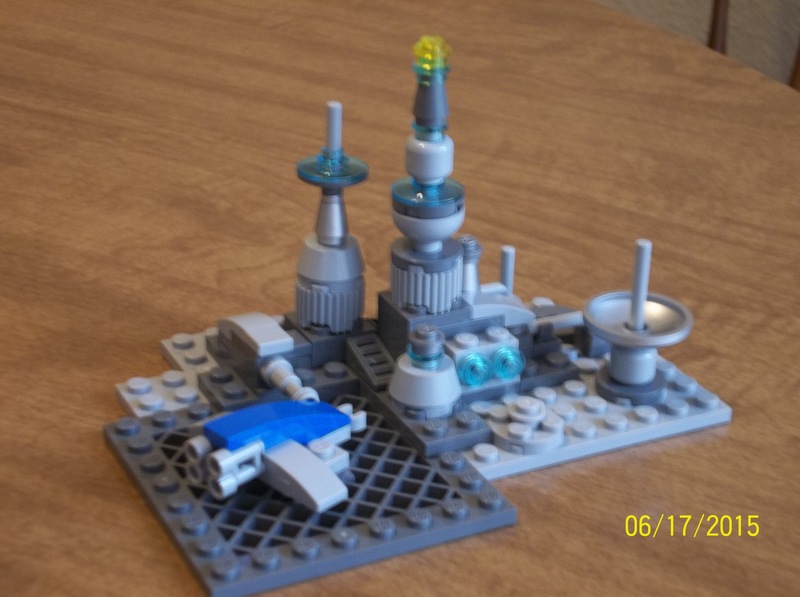 However, there are plenty of other adjuncts to the modern City and earlier Town themes, such as the jungle subtheme, the airport subtheme and the construction subtheme. 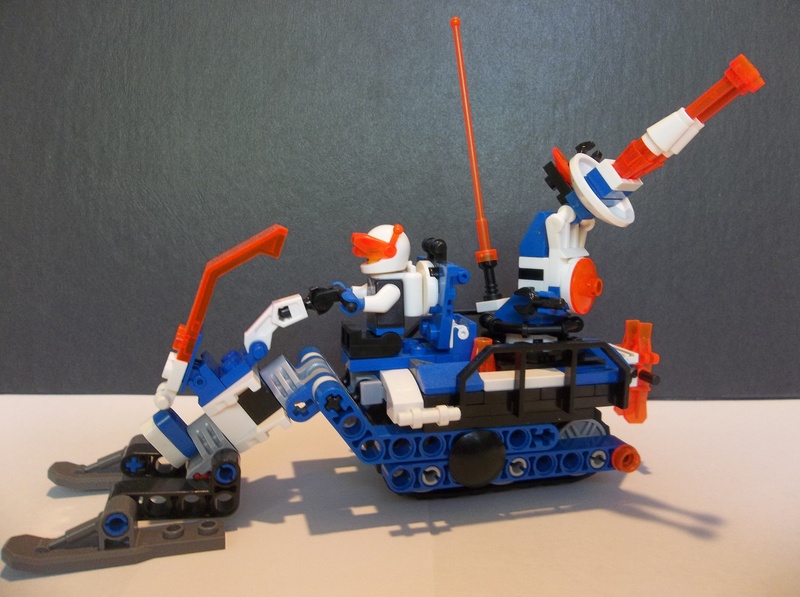 Ice Planet’s obviously a prequel of the Arctic subtheme, Police and Space Police go together, and I’ve played with the idea of space construction (witness this spacedozer). The idea of a Jungle Planet or a Modular Space City or a Volcano World space-based subtheme is a pretty good one, but that’s not what I’m doing here. 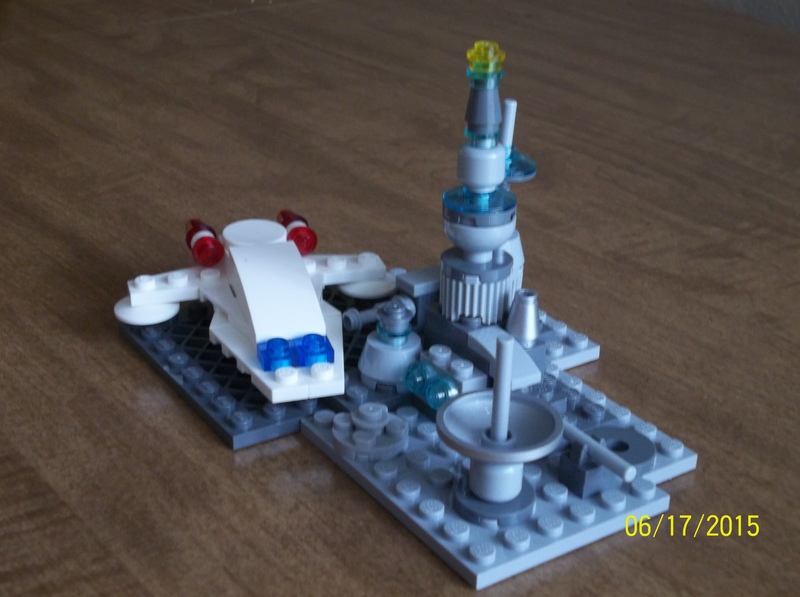 No, this build takes its cues from a variety of older City and Town subthemes; most notably the Coast Guard and Res-Q subthemes, but with a bit of the LEGO Fire Service thrown in. 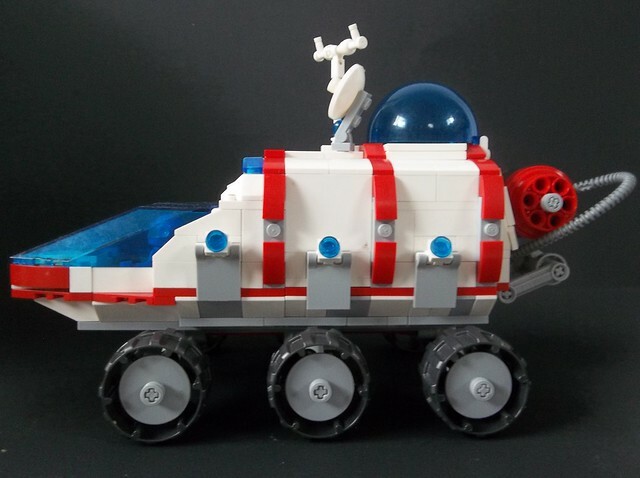 I’ve seen excellent models of space ambulances built by other people, and the airport subtheme is cosmicised every time someone builds a starliner or personnel shuttle, but to my knowledge I don’t think I’ve ever seen a space rescue build. 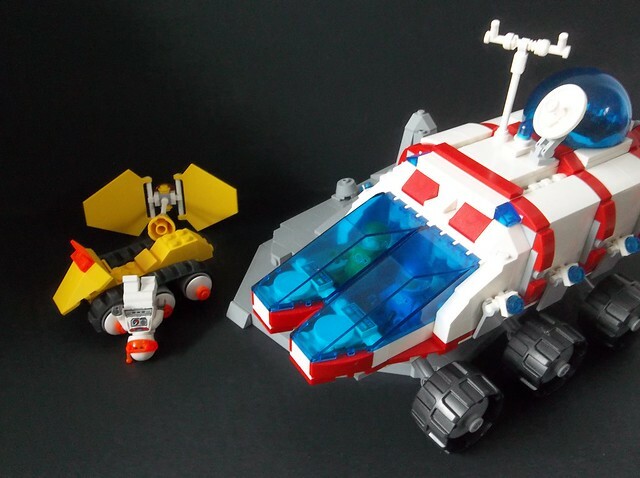 Taking my nomenclative cues (no pun intended) from the old Res-Q line (1998-99) as well as the various classic Space themes, I’m calling my LEGO Space Rescue Service “Q-Tron”. 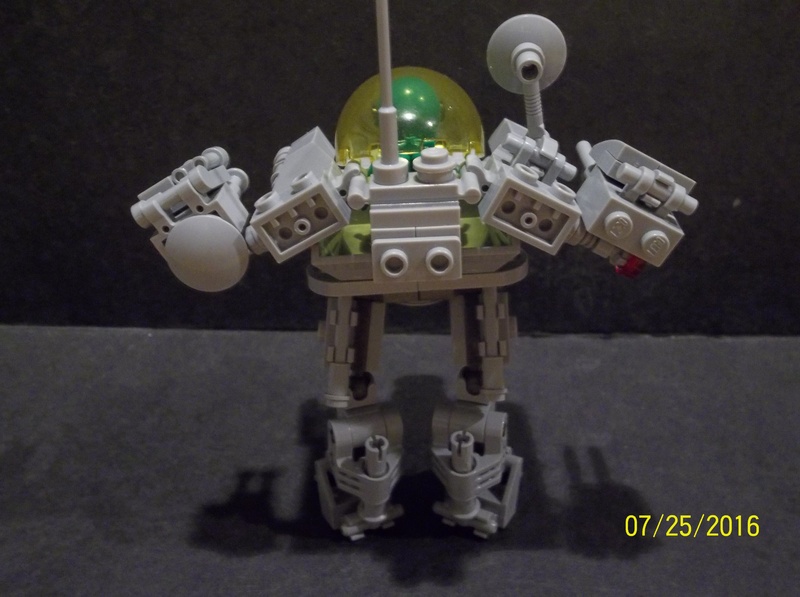 This, then, is the Q-Mech. Selecting red and white with trans blue transparent elements and grey structural highlights as a colour palette both high-visibility and distinct from the various early Space themes, I thought about building a large emergency recovery vehicle-type rover with towing hooks and winches and so on, but I really wanted 6-8 large Technic-type wheels and the only colour I’ve got in sufficient quantity is gold. And that doesn’t work with my chosen colour scheme. 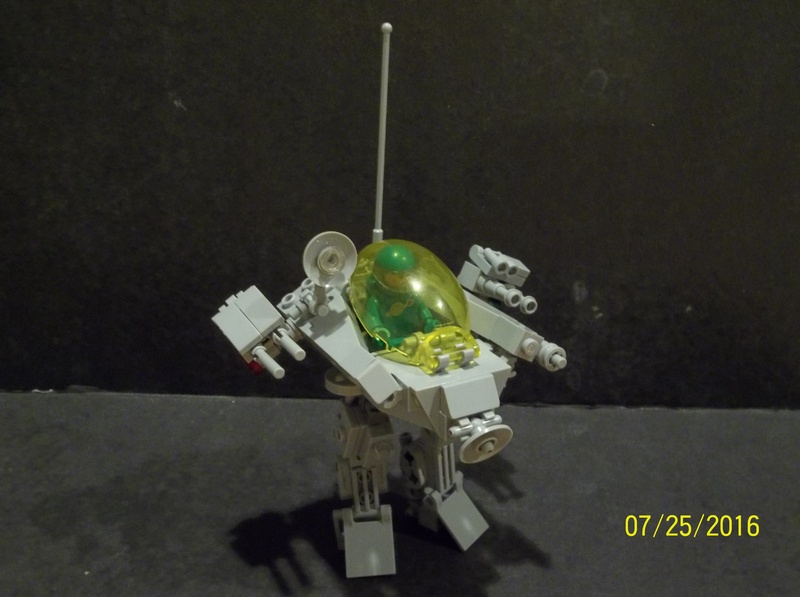 So, more or less done with spaceships for the moment, I decided to build a mech instead. 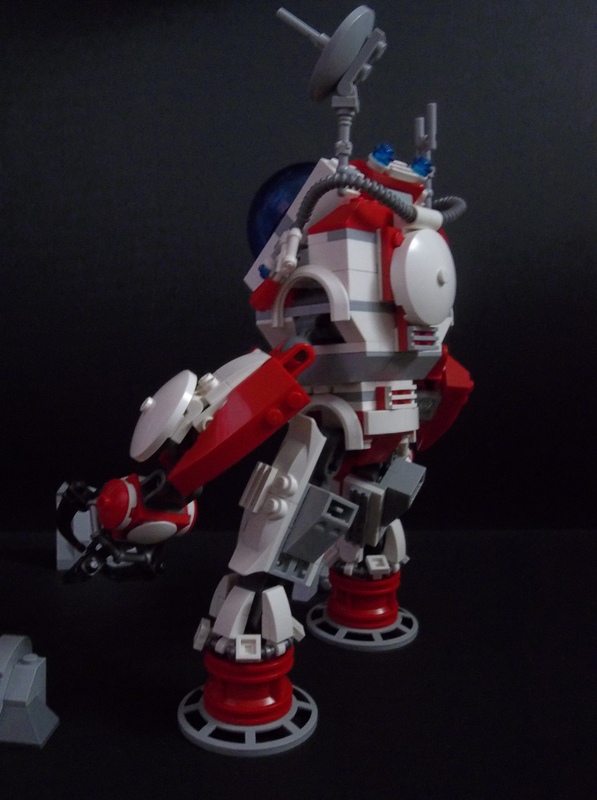 The Q-Tron rescue service mech is a large (ish) humanoid mech able to navigate rough terrain and provide heavy backup for the Q-Tron emergency response teams. 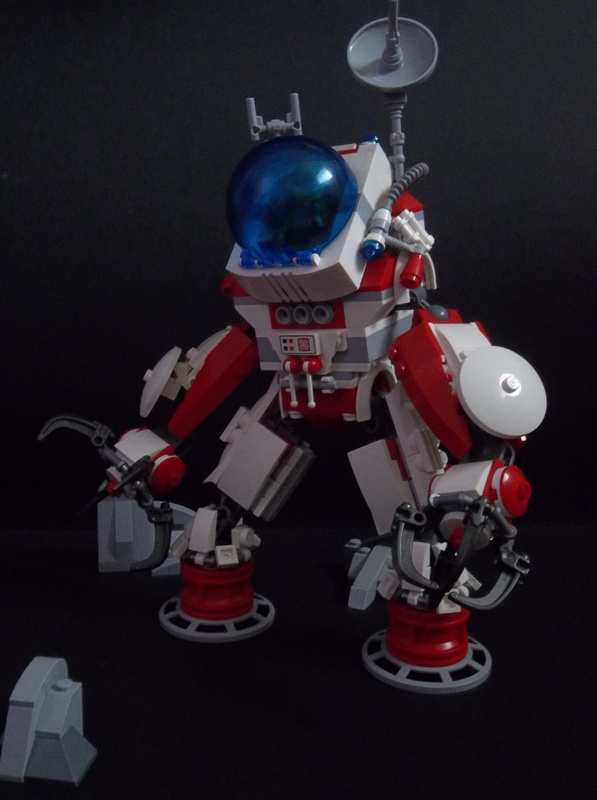 Relatively generic and adaptible, the Q-Mech is used in a variety of space rescue roles wherever large amounts of extra strength are required, including moving debris in the wake of planetary quakes or landslides, crash recovery and cavern bracing. 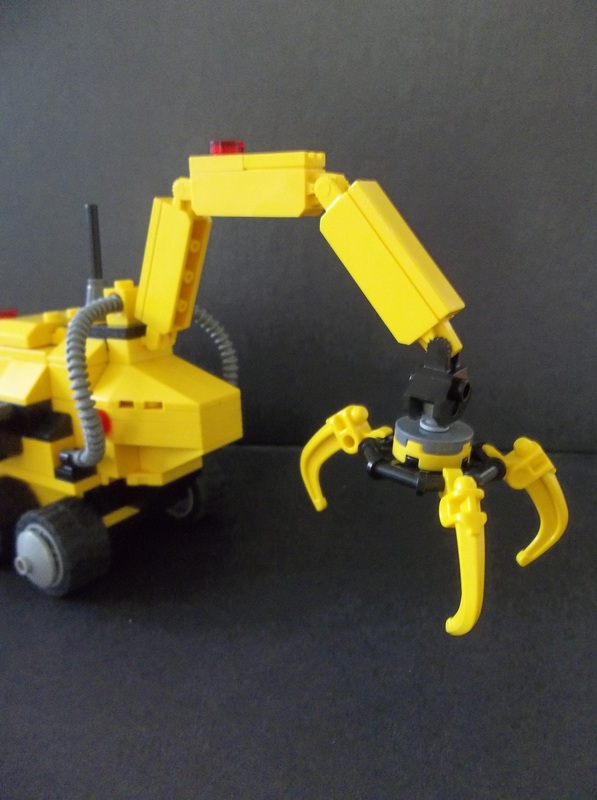 The mech’s clawed hands are capable of considerable delicacy despite their size, and are frequently employed Jaws of Life-style in crash recovery situations. The Q-Mech contains a powerful onboard atmospheric scrubber and liquid oxygen tank which can be plugged in externally to those of a vehicle or space habitat in the event of an environmental systems failure. The twin nozzles on either side of the cockpit can handle external hoses, though they are multipurpose in design and also function as part of the mech’s fire suppression system. The vacuum of space serves as an effective fire suppressor for most types of fires, but there are still various chemical agents in use which contain enough stored oxygen to combust even in vacuum. These deadly “vacuum fires” cannot be controlled with traditional methods of fire suppression, but the Q-Mech uses powerful “dry-foaming” flame-retardant chemicals to encase and absorb the energy of a vacuum combustion event. 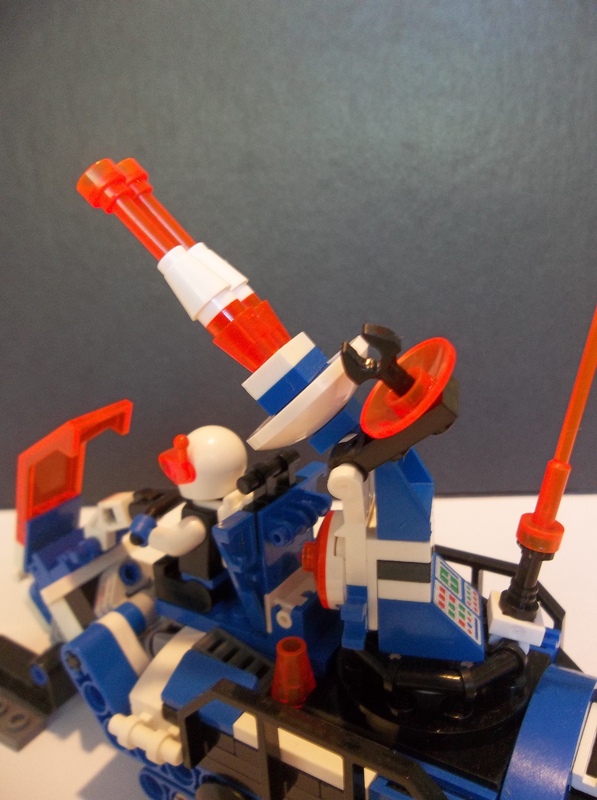 I think my favourite part of this mech is the sloping windscreen interface. A little finicky to put together (it more or less exploded a couple of times during construction when I squeezed too hard), it’s one of my better approaches to a mech cockpit. And the nozzles hide the way it’s done quite well. 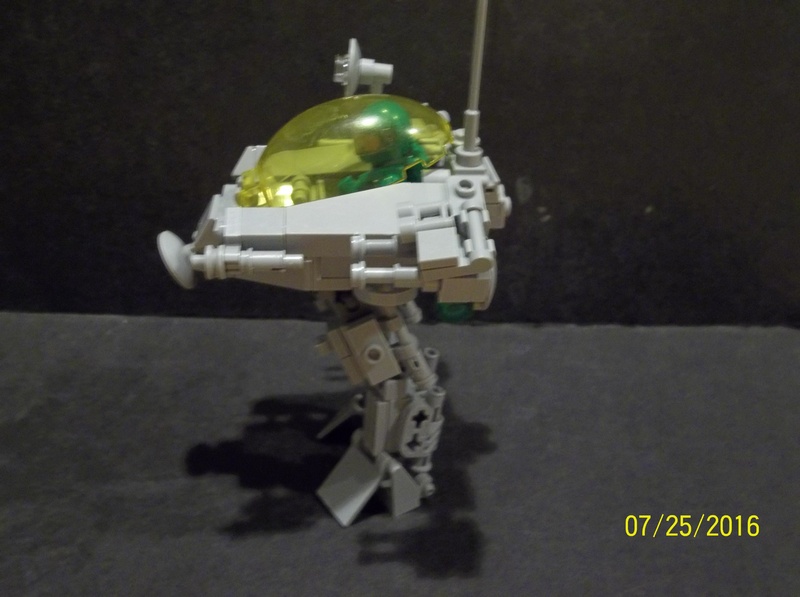 I think this may be one of my better mechs yet, even though I’m not really using advanced joint techniques on it. I’m not convinced I could scale up the joint techniques I’ve seen to something this stocky and robust. 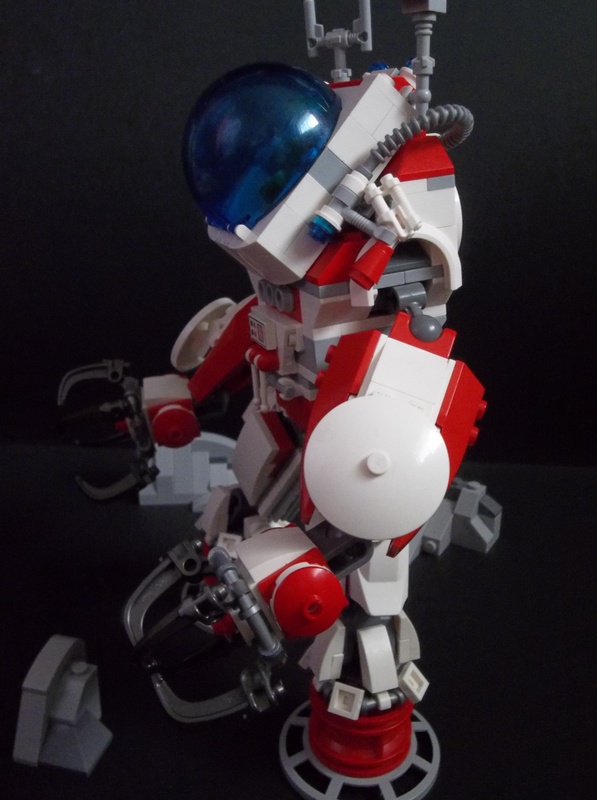 Still, I’m satisfied with the way I’ve disguised the nature of most of the joints. 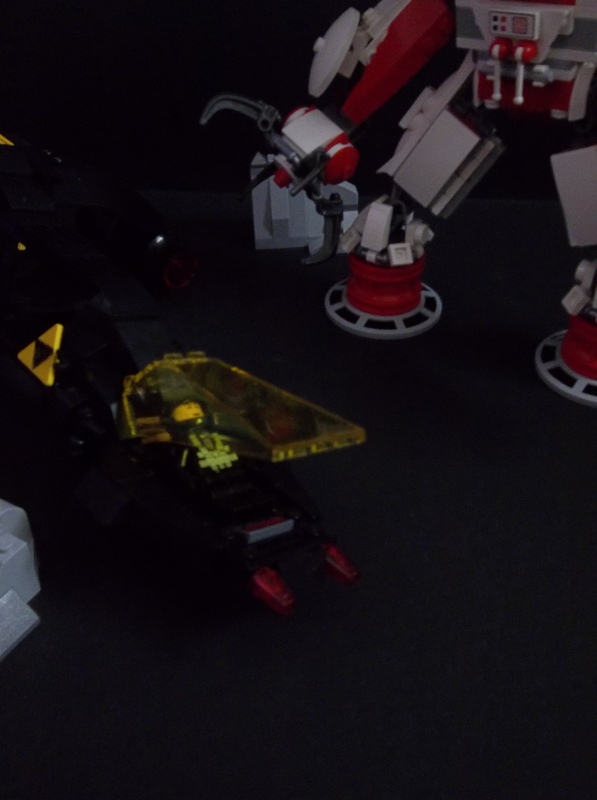 Because I wanted to show it in action and still had the Black Horus built, I ended up with a situation in which I have a downed enemy Blacktron pilot being rescued by the Q-Tron mech. A little weird, but emergency services people don’t ask you whose side you’re on before they get to work. They just get on with it. 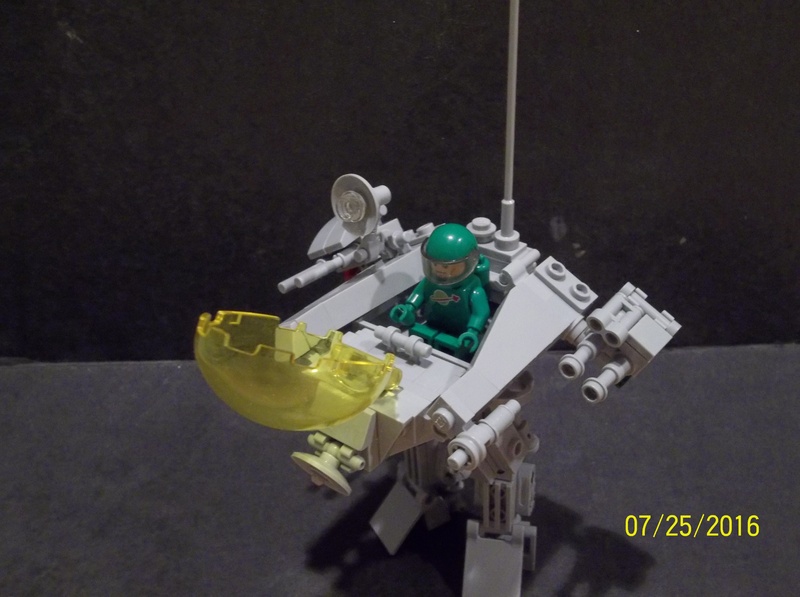 This entry was posted in Lego Classic Space, Lego Space, Mechs and tagged Coast Guard, Lego, MOC, Space, Space Rescue on November 15, 2017 by geoffhorswood. It’s the middle of April, and daytime temperatures in Texas are bouncing around the eighty-degree Fahrenheit mark, or closing in on thirty degrees Celsius and the sort of temperature only reached in Britain in the height of summer. 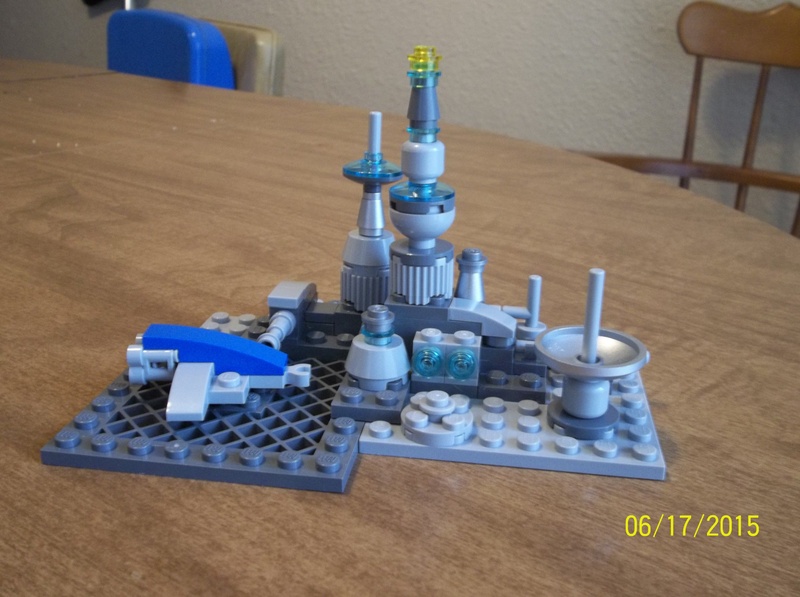 It must be time for another Ice Planet creation. I started this model with the intention of using one of my new rubber caterpillar tracks to make a small skidoo-like vehicle. Skis in front, single track in back, room for a single scout driver, that sort of thing. Try as I might, I couldn’t seem to make the single rear track work for anything remotely as slim as I wanted. Everything ended up being far fatter than I was looking to build. And it didn’t help that the ski steering column was a pretty substantial affair, either. Shrugging in resigned desperation, I decided to double up the tracks and build a side-by-side double-wide version of the track section. This made a considerably larger vehicle than I was initially intending, but on the other hand it gave me the perfect excuse to mount a radar-guided twin plasma cannon in the back. 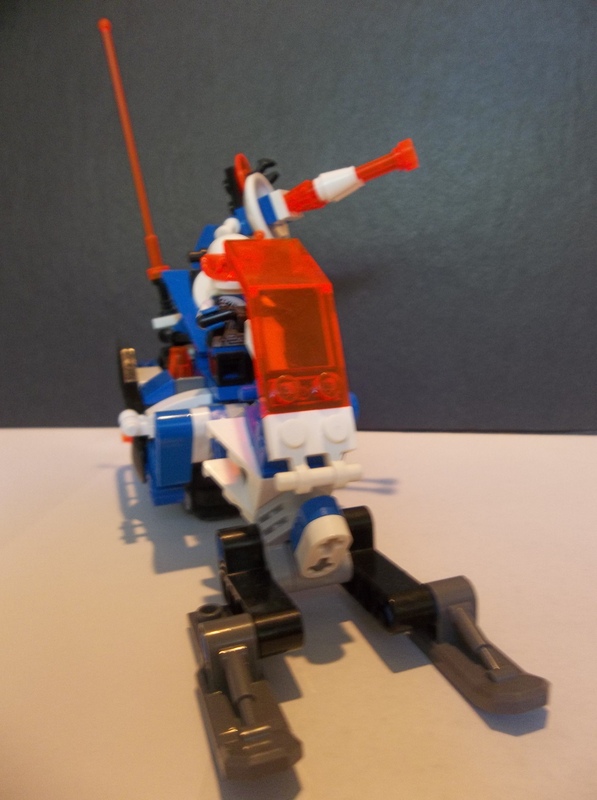 So it’s no longer the diminutive personal scout vehicle I anticipated building, but a heavy skidoo-mounted space defence cannon is a worthwhile addition to the Ice Planet folks’ vehicle inventory, and I rather like what I’ve built, so here it is. 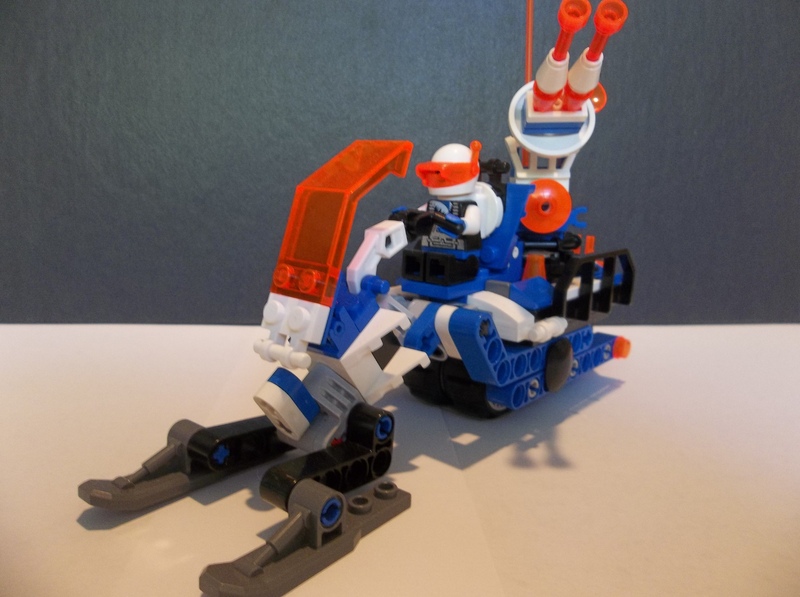 This entry was posted in Lego Classic Space and tagged Ice Planet, Lego, MOC, Skidoo, Space on April 18, 2017 by geoffhorswood. 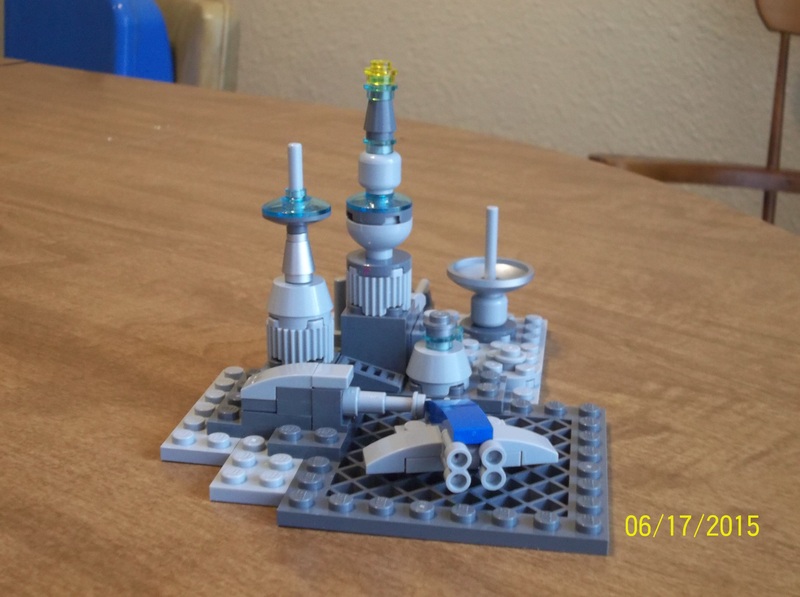 I like to build spacecraft and I work in construction, so you’d think the intersection of the two might be more of a common theme in my work. Maybe. Not so; I’ve toyed with the concept a little, but perhaps because I work around them all day, bulldozers are usually boring to me. 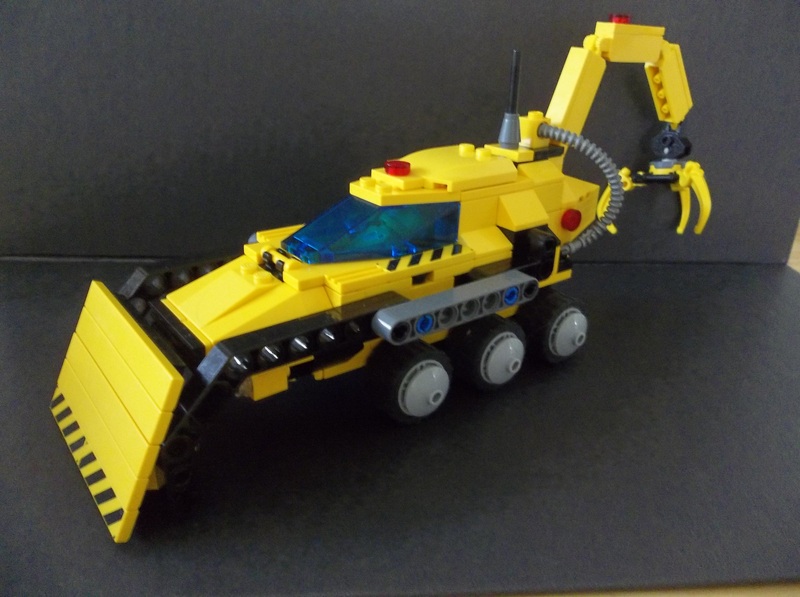 So it was a refreshing challenge for me to try to build this spacedozer. 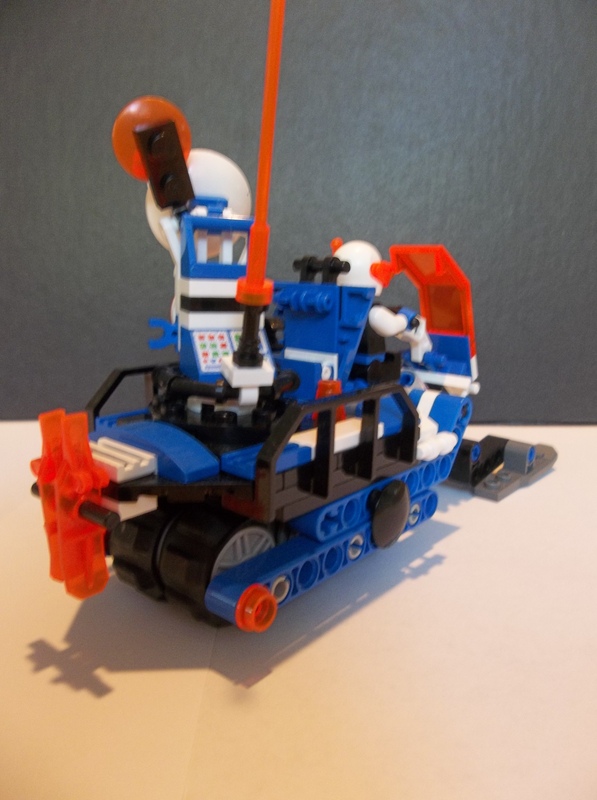 Space emergency vehicles seemed like a good idea, but a vastly better builder than I posted an amazing space ambulance rover, so I didn’t want to do that. And Space Police is already a thing, while space fire-rescue doesn’t work because you can’t have fire in a vacuum. 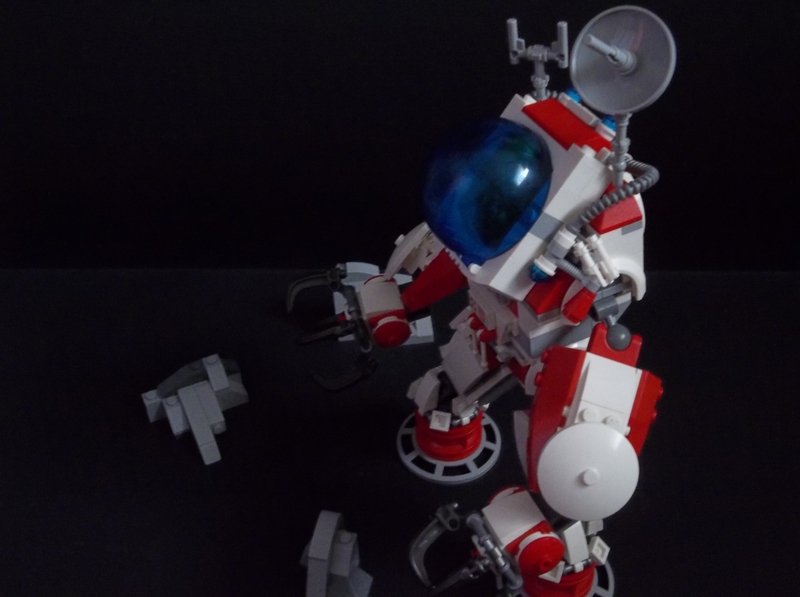 Space construction seemed like the next best option. 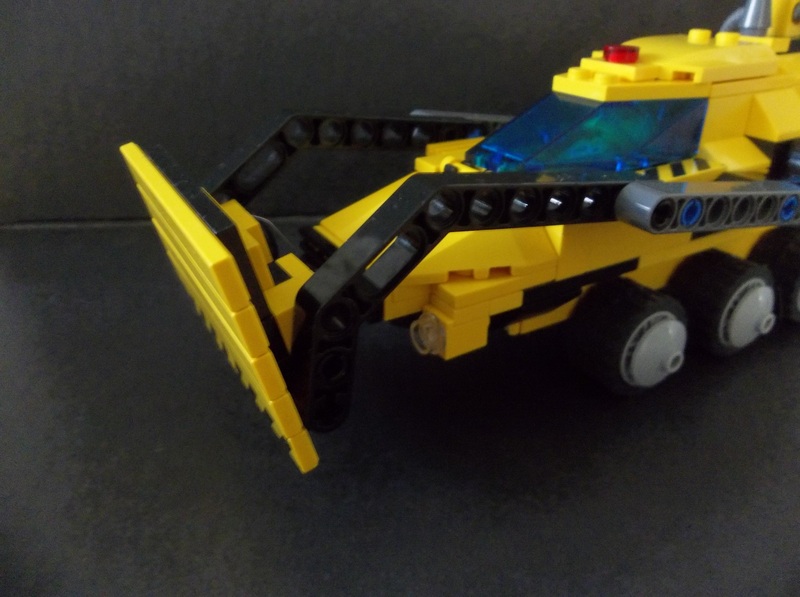 This rover is entirely too sleek to be truly realistic as a construction vehicle, which are normally blocky, clunkily-shaped thIngs of brute power. 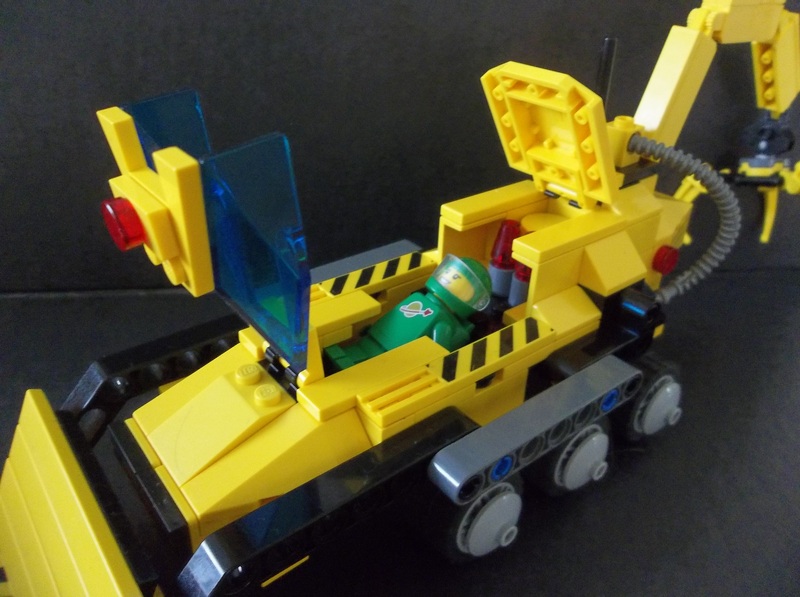 But it works as a sort of spacedozer. The dozer blade even raises and lowers, while the rear grabbing arm is perfect for lifting and carrying. 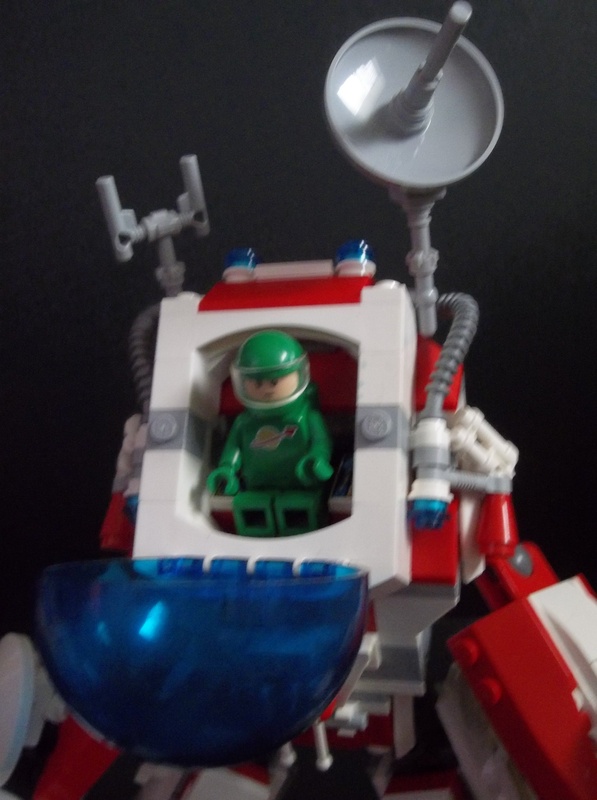 And it has a green astronaut pilot in keeping with my personal decision that the green suits represent Space Fleet’s logistics and support command. It’s not my greatest model ever, but it’s sort of fun. 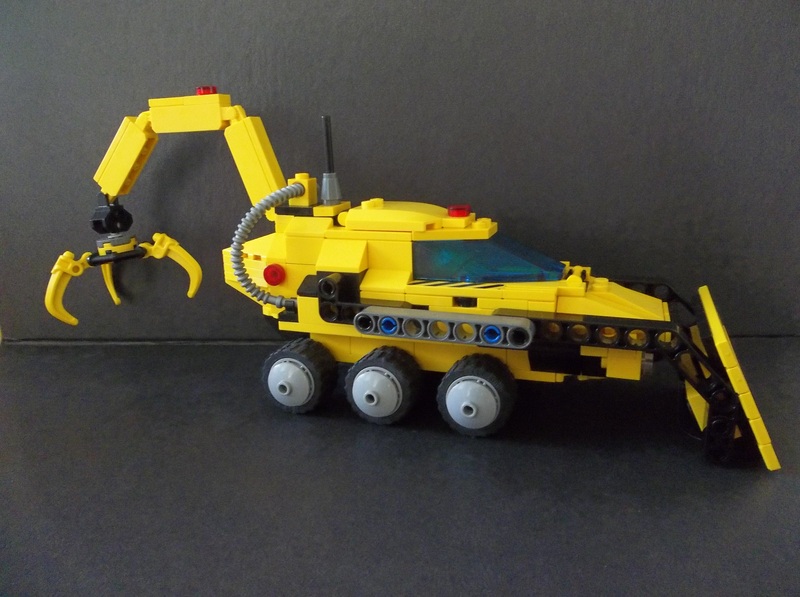 This entry was posted in Lego Classic Space, Space Construction and tagged construction equipment, Lego, MOC, Space on March 8, 2017 by geoffhorswood. 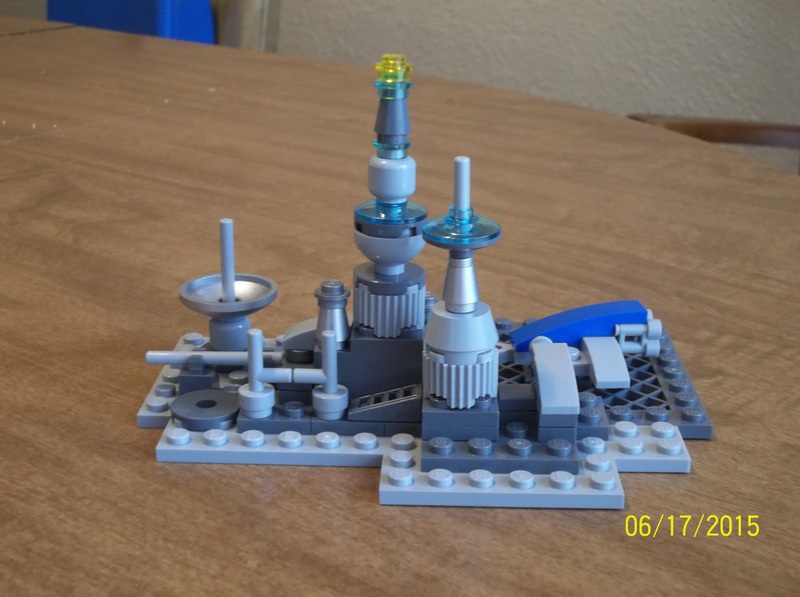 It’s amazing to me what gets liked and what doesn’t on Lego.com. Anyway, I don’t have much to say about this, so enjoy the pictures. It’s named after the Queen of the Scythians. 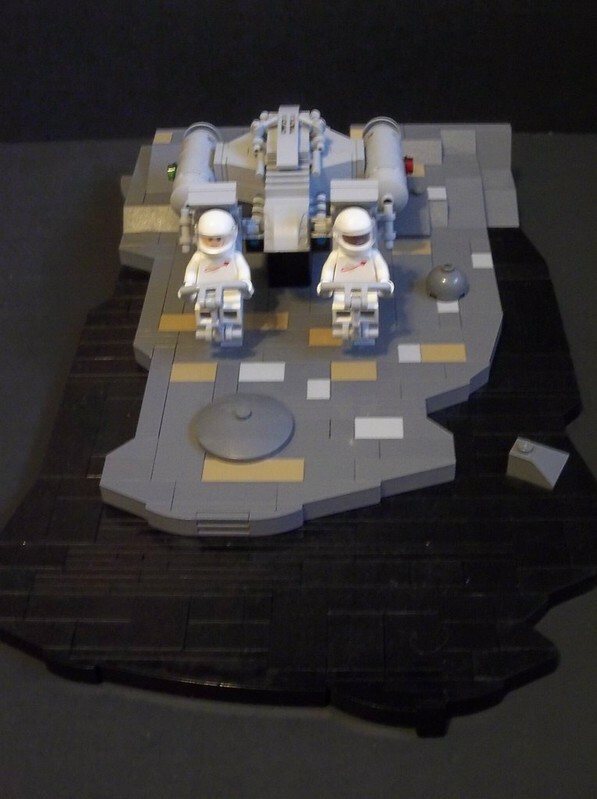 This entry was posted in Lego Classic Space and tagged Base, Classic Space Lego, Lego, Lego Space, Space on July 17, 2015 by geoffhorswood.